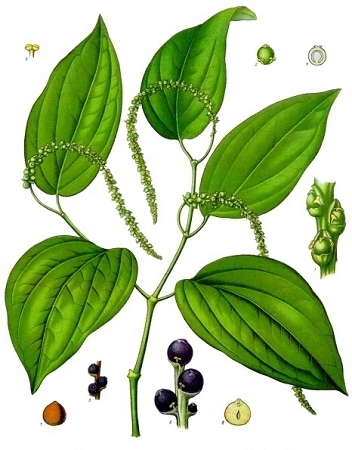 Black Pepper essential oil is distilled from the dried fruits of the Pepper plant. It is native to India and is commonly used as an energizing herb. Black Pepper essential oil is considered to have warming and circulation-enhancing properties that make it valuable for use on sore muscles and joints; just a couple drops in a carrier oil of your choice makes an excellent massage oil. The spicy properties of this essential oil also make it a surprisingly pleasant oil to use in essential oil blends. It goes especially well with Ylang Ylang, and is considered to be a mild aphrodisiac.